In this review, I would like to tell you about one of the most popular espresso machines by De’Longhi that has a standard manual milk frother. Despite the fact that the machine makes espresso (or variations such as ristretto or lungo) in a fully automated mode, the manual milk frother means that milk for a cappuccino or latte has to be frothed manually using the steam wand with a special attachment called panarello. In the USA and Canada, this machine is known as the ECAM22110SB or ECAM22110B (they differ only in color). In Europe, as well as in the UK (yes, i know they didn’t exit yet), there also is a model with the code ECAM22.110.B, but more often this coffee machine is sold under the new name – ECAM 21.117 (or 21.116). There are several color choices, including the rare 21.117.SB (black and white striped front) and 21.117.W (white). Nevertheless, it is actually the same coffee machine! There are no differences, except for the color and material that the steam wand is made of. 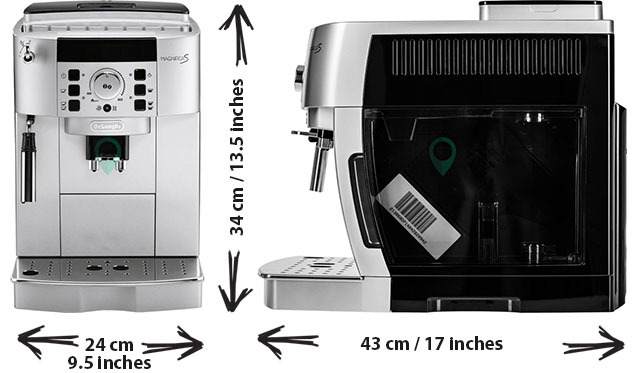 Moreover, De’Longhi has put a number of similar coffee machines (to be described below) on the market that are based on this standard model, most of which only differ from each other in design. In addition to the numerical code, the coffee machine has a more popular name in words. In Europe, this product line is known as Magnifica S and Magnifica XS in North America. This may be confusing, as it seems that the letters S/XS refer to the size of the coffee machine. As if it is Small in Europe and Extra Small in the USA. But this is not the case! They are of the same size and height – 34 cm (or ~13.5 inches). The difference in specifications is a mere mistake by online store content managers or the result of various alterations (with or without an overhanging container for coffee beans). Check current prices and deals @ Amazon.com for silver ECAM22110SB or black ECAM22110B. DeLonghi ECAM22110SB Compact Automatic isn’t so compact as it may seem. What are the advantages of the ECAM series compared to the ESAM series? In other words, what are the differences between the Delonghi ECAM22110B Magnifica XS and the old ESAM3300 Magnifica? The Delonghi ECAM22110B/ECAM 22.110 B carries on the glorious traditions of the ESAM3300 Magnifica, which is the prototype for all ESAM models. Detailed information on them is provided in this review. In order to not repeat myself a lot, I will only mention that the same removable CRF brew unit is used here (but there is a slight difference in the brew unit catch and chamber, which means they are not interchangeable). Moreover, we can find the same reliable pump (15 bar), similar metal grinder with 13 levels of grinding and a 1.8l water tank that is removed from the front (which is very convenient). Where they differ is the thermal block. The ESAM is supplied with a so-called “flat” heater, while here (ECAM) a “round” heater is installed. The key difference is that the round one is more durable, while the flat one suffers from a leakage defect. It happens only occasionally, but everyone is well aware of it. Besides that, the round one is more powerful – it is ready for use a few seconds more quickly. The ECAM 22.110/22.117 has another type of body frame and a different, more sophisticated design, as well as the varying position of outer and inner components. On the one hand, this new body frame is substantially better; on the other hand, there still are some nuances (see below). Let’s skip evaluation of the design, as your mileage may vary. It is particularly convenient to remove used coffee grounds (14 servings worth from the front in one movement towards yourself) and the brew unit (from the right-hand side). The maximum height of the cups that can be used has also increased to 142mm (5.6 in). A latte glass can now fit into this coffee machine. The container for coffee beans has acquired a seal for the lid, which allows it to preserve the aroma for a little bit longer. In case of heavy use, the 250 grams (which is 50 grams larger than the ESAM) still won’t last long, but it is nevertheless a pleasing addition. The ECAM works faster than the first model in the ESAM range. This became possible thanks to the thermal block that has a slightly higher capacity and the upgraded internal operating procedures, I assume. It is not a very sufficient difference, but it doesn’t feel as slow as it used to be. The more stable (and hot) temperature of a drink. Compared to the ESAM3000, the ECAM 22.110 coffee machine maintains a more stable temperature during brewing. It makes almost no difference for espresso, but is essential when brewing large servings of coffee, as its temperature does not lower dramatically and the final drink comes out hotter. Besides that, it also works more quietly. I do not have any hard evidence, but other reviews of the ECAM22110 coffee machine prove this unequivocally. Another advantage of the platform on the whole and the Delonghi ECAM 22.110 in particular is that when the steam supply is activated (using a separate button), the machine automatically drains off surplus water from the steam circuit to the lower drip tray during the first few seconds of heating. This means that when milk is frothed, it is saved from being spoiled by water. The De’Longhi 22.110 has a well-known issue with heightened requirements for voltage stability (old houses, weak wiring, other heavy power consuming devices in an apartment/office). This is the same issue one of the older Bosch models has, namely the TES50129RW. If the red exclamation mark light on the panel turns on when starting the machine (meaning that it is necessary to clean the inner surface of the coffee machine, according to the user’s manual) and you are sure that the brew unit and its chamber are clean (you might have cleaned them right after the last brewing), this is caused by a voltage surge in 90% of cases. The solution is to connect the coffee machine to a power source via a voltage stabilizer. Moreover, this model, like all De’Longhi coffee machines, is prone to brewing coffee a bit hotter and with a slightly more bitter taste than its main competitors (i.e. Saeco, Bosch and Jura coffee machines). Of course, the model has all of these “disadvantages” while the other characteristics remain the same, and while the De’Longhi may bring out sour notes in the taste, the ECAM22110 suits people who are fond of strong espresso brewed from dark roast beans Starbucks-style. Different control panels. The De’Longhi ECAM 23.420 SB coffee machine is equipped with a more up-to-date and trendy panel. The text display has been improved and its contours are simpler. The twisty knob has a new purpose: it now adjusts the size of a drink, but not its strength. Speaking of which, there is a catch – it so sensitive that it can easily skip 2-3 levels when twisted sharply. However, it is easy to get used to this. Alongside the display, a sound signal when pressing a button (which I personally consider an unnecessary option that can be switched off in the settings) and wake-up timer have been added. The latter is used for warming up the machine in the morning so that it is ready to use at a certain time when you get out of bed (the process takes 2-3 minutes) – in case you don’t have a minute to waste. In my opinion, these are unnecessary bells and whistles. The manual milk frother with foam adjuster. The De’Longhi ECAM23.420 SB has a standard panarello wand as its manual milk frother, but it is an advanced version of the one that the previous standard model has. 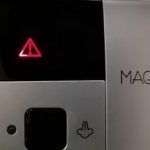 The wand is supplied with an additional ring adjuster in this model (I have already looked at this innovation in my De’Longhi ECP3630 review), which adjusts the foaming. Besides standard milk frothing, there is an option to heat the milk without foam. People, who are not fond of cappuccino and prefer plain coffee with milk will appreciate this option. As well as those who enjoy milk with honey or hot chocolate. The last one is all that really matters for me. Whether you need this option or not should be considered thoroughly before purchasing, otherwise you should buy the cheaper ECAM 22110 and will be satisfied with your choice. Nevertheless, if there is an opportunity to purchase the 23.420 at the same price as the 22.110 during sales, those little improvements may be a nice bonus. However, do not expect any improvements in the quality of the coffee – while the controls of the machine have been modified, the settings themselves have not changed a bit. There are still 4 temperature modes, strength adjustment from 6 to 14 grams per serving and 13 levels of grinding as in the standard ECAM 22.110/21.116/21.117. Another similar model is the ECAM23210B. The design is so similar to the improved 23.420 (see above) that they look identical when not in operation. The irony is that despite this, it is actually less functional. Despite having the same design as the improved 23.420, it has even less settings than the ECAM22110B/SB. This model has the standard milk frother without a switching ring, like the basic 22110, and doesn’t have the wake-up timer either. Nor does it have a display: when the coffee machine is turned on, you will notice that it is not a full-featured display, but LED lights, like on the ECAM 22.110. In other words, the key difference between the 23.210 and 22.110 is the modified control panel and white color. I agree that it looks a lot more stylish (the 21.117W in white is already on sale in Europe though), but it makes no difference to the coffee flavor. In addition, it has fewer temperature settings (3 instead of 4), which is not as crucial as it may seem. The strength and volume adjustment has been changed a little bit. The main twisty knob adjusts the volume within 4 preset options (40, 60, 90, 120ml), moreover there is a blank setting for your “favorite volume” (set from 20 to 180ml). Strength is adjusted by pushing the button: there are 5 options, while the 22110 has more precise multi-step adjustment. There is one new thing though – a serving size counter. Overall, the changes are so insignificant that one can claim the ECAM23210SB is just a more attractive model than the ECAM 22.110 SB Magnifics XS, but with different settings. Whether the design is worth the price or not is up to you. Last but not least, the third sister – the ECAM23120. In some countries, it is sold as the ECAM25120. This time we do indeed have some very important improvements over the basic 22.110. I am referring to the special LONG mode, when the coffee is brewed under low pressure. This mode is recommended if you prefer large servings of American coffee – it is made to imitate drip brewing. In this mode, the large serving is not over-extracted, not so plain and bitter, more flavorful. The coffee is brewed during two consecutive grindings of the beans. In other words, if there are both people in your family who are fond of classic strong espresso and those who prefer traditional coffee, this option is vital. There is a text display and the same settings for strength (multi-step adjustment from 6 to 14 grams), temperature (4 modes), grinding (13 levels), and serving volume as on the ECAM22110B. 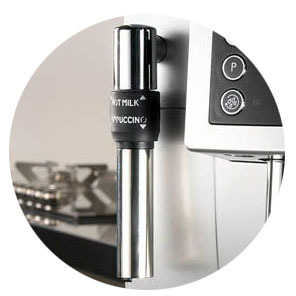 The manual milk frother is equipped with the ring adjuster that makes it possible to switch from the standard milk frothing mode (like on the basic 22.110) to the special mode for heating milk without frothing (like on the imporoved 23.420). It is interesting to note that the ECAM23120 in particular is often sold on sale at lower prices than the basic ECAM22110B. In such circumstances, the ECAM23120 will be the better option. 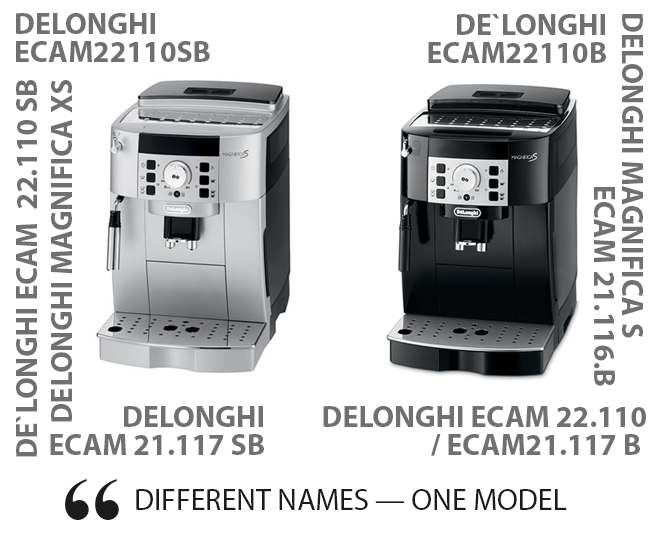 De’Longhi has produced several different models with different numbers and words in their names, as if the company did this on purpose to make comparing the dozens of models more complicated, but in fact there are not so many significant differences between them. Delonghi ECAM22110B/SB = ECAM 22.110 / 21.117 / 21.116. It is the same model, despite the fact that in some countries it is called the Magnifica S and in others the Magnifica XS. The letters B, SB and W at the end refer to the color only. There are no functional differences between models in different colors. The only exception is the material that the steam wand is made of. In different countries, the set of accessories is different. They are equally effective, but the metal one simply looks better and it is easier to clean dried milk stains off it (if you wipe the steam wand right after whipping the milk foam, there will be no difference in maintenance). The ECAM 23420 is a substitute for the 22110/21117 with a different control panel, a display instead of LED lights and – most importantly – adjustment of the milk foam height. This option will be not be useful for everyone: if you drink ordinary cappuccino, you can make it without using the option. The ECAM 23210 is exactly the same as the 22110/21117, but with another design and a different control mode. However, the ECAM 23120/25120 is the only model that sufficiently differs from the 22110/21117 from a technical point of view. It has the same switching ring for milk foaming as the 23.420 and a special low-pressure mode for those who are fond of traditional coffee (a large serving that is not strong). Moreover, a standard espresso serving will taste the same from each of these models. Despite the differences in design and position of the buttons, all the models, apart from the 23210 (which has 3 temperature modes), have the same key settings for strength (6 to 14 grams per serving), temperature (4 modes) and grinding (13 levels). « My review of the Mr. Coffee Café Barista / Oster Prima Latte espresso machine and its clones. Plus a comparison with the Delonghi EC860. Jura C60 comes with a semi automatic milk frother. By semi automatic I mean that it froths milk by itself, however, it does it as a separate process: you make espresso (one press of a button), you make milk foam seperatly (you move the cup under the frother and push another button) and add it to espresso to get cappuccino. I described more differences here (Jurs has a tube system): http://101coffeemachines.info/saeco-vs-delonghi/#tubevscarafe Delonghi ECAM22110B is equipped with simple panarello frother (steam wand), you froth the milk manually! Nevertheless, the main difference (except display, design etc, which are very personal) for me between Jura (any) and Delonghi (any), is that Jura has a built-in brewing unit. It means you can’t take it out for washing (like you will do on Delonghi). That’s why Jura requires cleaning cycles with Jura special tablets https://amzn.to/2T8n0Od every 200 cups and it’s highly recommended to do it beacuse you have no acccess to clean it in any other way. Still, in several years Jura will require a service with deep cleaning. Thus, the main differenece for me is maintaince cost and easiness of maintaince. With Delonghi you make brewing unit cleanings by yourself with water, while with Jura you buy special tablets to clean the unexctractable BU and then pay the service to clean it in 2-3 years. Jura indeed can make more rich coffee, mainly because it’s brewing unit is larger (16gtamms of coffee at maximum setting vs 14g in Delonghi). And no, I can’t confirm any special problems with coffee beans coming/nor coming to the feed in Delonghi. On any machine there would be problems if you use oily dark roasted beans (but usually it’s ok). Yes, I can confirm that Jura (except MICRO series) make a bit better coffee (for my taste), Delonghi just makes it a bit hotter and a bit bitter using the same beans, it’s good for those, who likes such taste profile. In other when set to max intensity how much coffee it will use when pressed single cup button, or when pressed double cup button. Thus, if you will set the strength to minumum (~6-7 g) then the double cup button will indeed use double coffee (2×7=14) and double water. However, if you are on maximum settings, the effect will be more similar to “the same amount of coffee for double amount of water” (maximum rise from 12g to 14g). P. S. Everywhere where I and other articles mention grams it is approximate values. Because none of the automatic espresso machine can measure the weight of coffee, all of them just measure and adjust the grinding time. For example, if 10 seconds of grinder gives 10 grams of ground coffee on average coffee beans, then 7 seconds will give 7 gramms. This is how the machine adjust the intensity. It means that if you use big oily beans, you may get less coffee powder on the same settings if compared to some other coffee blend. Many thanks for your kind and rapid answer. You are really helping the people. Thank you. I have one more question, the re-set the buttons with the cups, the double-cup buttons (short double cup, and long double cup) have their own re-setting or they are always double size of the corresponding single cup button? They are always double size of the corresponding single cup button. However there is again a nuance about absolute maximum limit. Machine can’t give more than approx 200-250 ml of water per serving. That is if your single button will be 150 ml, the corresponding double cup will stop at 200-250 ml (I don’t remember exact amount now, but smth like this). But 30ml-60ml, 50ml-100ml, 75ml-150ml etc works fine. Great answers. Many thanks Dmitriy. Such an amazing article and so much work. We thank you so much for all these answers about coffee that you give for free. I am a total coffee noob who wants to make a purchase on a good espresso maker. 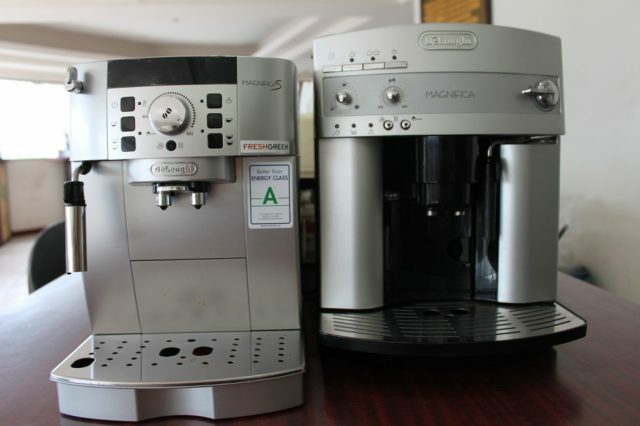 But if you could give me an opinion as an expert about two more models and which would be better..
How do these two or just Gaggia Brera compare to Delonghi Magnifica S ECAM 22.110 ? I never heard about “Titan” version of Saeco Lirika One Touch Cappuccino. However, it’s probably just a color designation and it’s the same machine as ordinary Saeco Lirika One Touch Cappuccino (Saeco Lirika OTC), which I know. It’s not strange that Lirika OTC isn’t widely available, because it’s a semi-commerical modification of Philips HD8829/Philips EP3558. Saeco sells its home and commerical machine throught different distributors. That’s why Lirika as well as other commerical machines are less known. 1) Lirika OTC is a good machine. Despite it’s marketed as coffee machine for offices, it’s still suitable for home use and is even a bit better built than home models. The only weak thing is a Multi-Functional Valve – like this one http://amzn.to/2TY34xZ This part frequently brokes on this machine. The very same part is used on other Saeco’s machines, neverthelss, I heard of mass failures only on Lirika. Probably because Lirika is usually used in office, where coffee machines generally break more often. Lirika OTC has not much adjustments also: coffee intensity (3), grind (5) and temperature(3) settings. But it’s usually enough for ordinary users. Big water tank and bean hopper (which is useful in office) is better to be filled 50% in home use – you’ll have fresh beans and water for your coffee. Everything else is good about this machine. It’s the only machine from your list, which is really full-automatic, by the way. I mean it has automated milk frother, not panarrelo. 2) Gaggia Brera is very similar to Saeco XSmall (here is my review http://101coffeemachines.info/saeco/xsmall-hd8645-8745/ ) Very limited adjustments, but metal coating. Espresso taste will be identical to Lirika OTC. 3) ECAM 22.110 has more adjustments, it makes a bit more bitter and a bit more hot coffee if compared to Saeco/Gaggia. Some like it, some not. Surely, you can always change the coffee beans, which will give no bitterness even on Delonghi (and vice versa). Overall, ECAM 22.110 is the most functional in your list (because of more adjustments). However, I would choose Lirika OTC (because of automatic milk frother, but check if you have a local repair serice of Saeco in your town, in case above-mentioned valve will break down – it’s not high chance, of course, and it’s quite cheap replacment, but still it’s better to consider) or Brera (I assume it’s the cheapest in your list, as well as Lirika it makes the best espresso – for my taste! – and looks better imho). Delonghi is a golden middle if you are not sure if default settings of Brera/Lirika will give you the taste you want and therefore you want to have more adjustments “in reserve”. To George: I have the 22.110 and I am very happy. 3) Magnifica S ECAM 22.320.SB has a text display while ECAM 23.120 SB has 4 icons (pictograms). Different messages shown in icons are not very intuitive, thus, you will have to have an instruction manual near by all the time to understand what the machine is trying to tell you – to fill a water tank or to empty grounds (used coffee) container, for example. The latter one is a main reason why I “vote” for the 22.320. However, as I said, they are very similar. And they both have new hot milk ring on the panarello and they both have special program for cafe americano, which I described in my review. Thus, if you really like black color of the 23.120, then it may be OK to choose it, you can get used to icons. Quick question, is Ecam 350.15 more advanced than 22.110? Does it have any internal advantages (new grinder, more settings)? 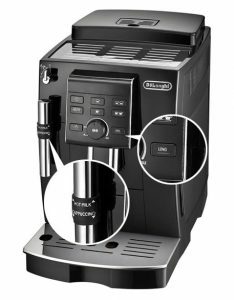 – coffee intesity asjustment has less steps (because on 350.15 it is set in the menu – it allows to choose among 5 settings, while 22.110 has stepless rotary knob. Overall, for the similar price I believe that 350.15 is more functional. Mainly due to americano mode and separate settings. 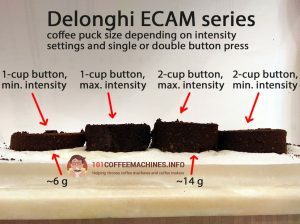 However, the quality of espresso would be the same as on 22.110.
i am a barista and i would like to tell me the differences(if there are any)between Delonghi S ECAM 22.110.SB+Delonghi S ECAM 22.110.B. and why there is 100$ difference?only for the color?? The machine model is the same? Yep, only the color and (in some countries) the panarello wand: plastic or metal. There is no functional difference. i have decided to buy the Delonghi S ECAM 22.110.B. do you have to tell me any other machine at the same money? In other words, the key difference between the 23.120 and 22.110 is the modified control panel and white color. I have a ECAM23210 and the grinder only grinds for 4 seconds regardless of intensity or cup size. Any ideas? Great review and very helpful. 1) Easiest one, but likely will not help – restore factory settings as descibed in the manual. Make several cups. 2) If #1 doesn’t solve the problem, then try to make 4-5 cups with small amount of beans. The idea is to let the machine understand that there is not enough beans in the middle of the grinding. In this case electronics sometimes are raising the grinding time automatically. If this helps at least a bit (e.g. it raised grinding time from 4 to 4.5 seconds), then continue until desired time of grinding. 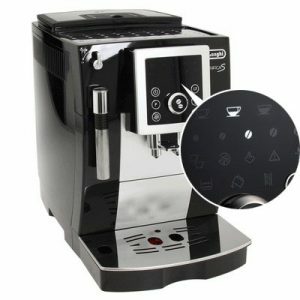 Hi, trying to decide between DELONGHI ETAM 29.510 and ECAM 23.120. Found both for the same price, not sure if ETAM is better? Hi, Sylvia. ETAM machines are similar to ECAMs but with more compact body (however, water/beans tanks are also a bit smaller). Thus, ETAM is usually more expensive. Comparing ETAM 29.510 and ECAM 23.120 – they both have the same adjustments, the same extra function – americano (LONG mode). The only difference is the ring on panarello of the 29.510, which can deliver hot milk without frothing. I personally would prefer ETAM for the similar price tag if only you are not installing the machine in the room far away from the kithcen/sink (with ETAM you will need to add water, empty waste tray more frequantly). Hi DMITRIY, I have de delonghi 22.320 Sb, could you please tell me the amount of beans, ml of water for each pre-set button. And does the LONG button uses double the amount of the beans because I hear it grindes twice? And what is the difference between LONG coffee and long espresso coffee? Can’t be sure for 100% about 22.320, because I tested the LONG button on other Delonghi models, where LONG indeed works like: grind, brew, grind again, brew again. That’s the first difference from using espresso button for long drink. Also, in LONG mode the machine uses lower pressure (the pump works inintermittent mode: 1 second – works, 1 second – pause, 1 second – work again etc) – and this is the second fact why it’s differenet from espresso button. 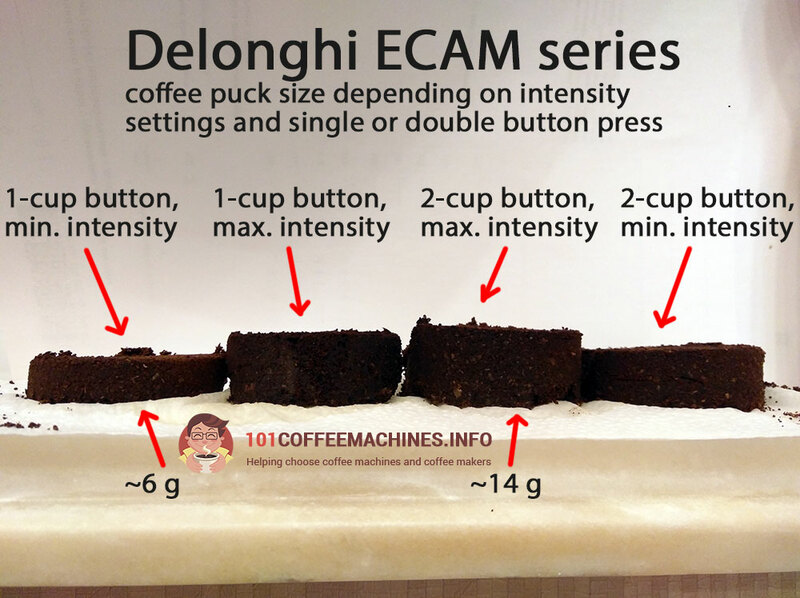 99% that the 22.320 is programmed this way – like other espresso machines by Delonghi of ECAM series. Hi! i would like your opinion on the Breville Barista Touch. Is there a machine i should be looking it at that has similar features for better value? 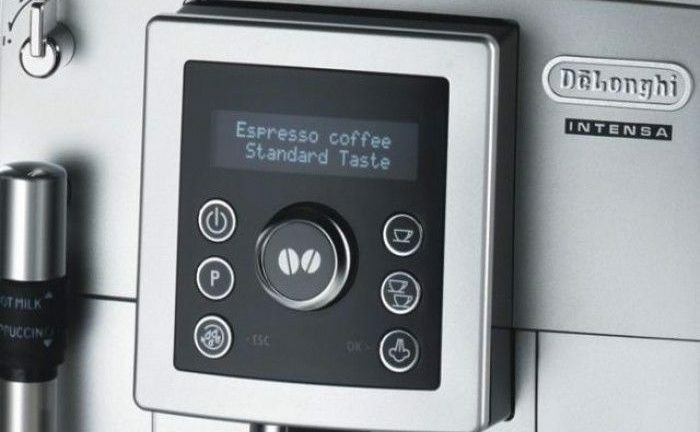 1) If you want similar feautures (LCD display with precise electronic controls of coffee/milk temperature, prebrewing, wide grind levels and recipe memories etc) AND you want this to be fully automatic, then there are flagship models like Saeco Xelsis, Melttia Barista, Siemens EQ.9. 2) If you want all these feautures, but not fully automated as in the case of Barista Touch, where you can set all these settings, but you still need to manually move portafiler, tamp, pour milk, wash the filters etc, then there is no direct competitors. But you may have a look at the new Delonghi La Specialista, which is similar to previous model of Breville – Barista Express.